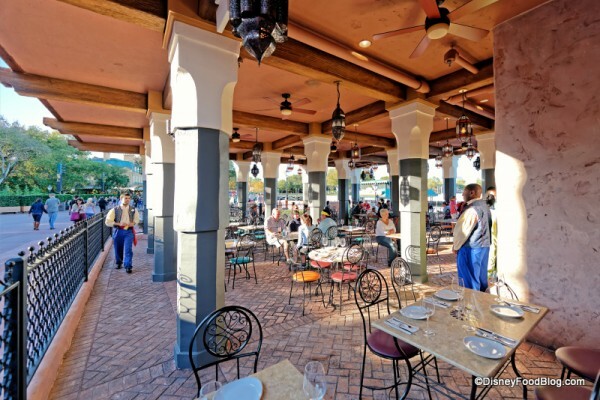 Just a couple of days ago, we brought you a first look at the brandest, newest restaurant in Disney World! 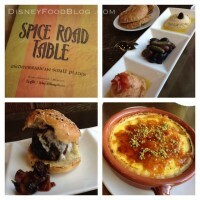 Today, we finally get to sample even more of the menu from Epcot’s brand new eatery, Spice Road Table! Located right on the water in the Morocco Pavilion within World Showcase, Epcot’s newest restaurant offers small plates and an interesting wine list featuring bottles from throughout the Mediterranean region. 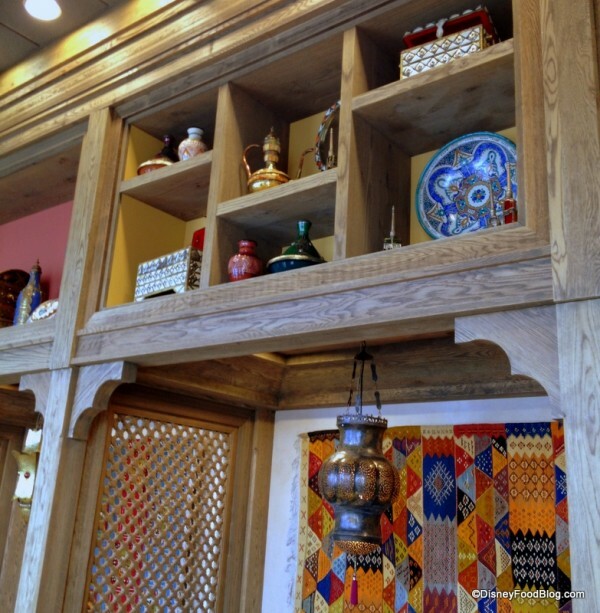 Last week, we gave you a sneak peek at the inside of the Spice Road Table, as well as the new shops and Juice Bar! In addition, we had the opportunity to taste several of the desserts that are featured here, and we’re loving everything we’ve sampled so far! Today, we’re going more in depth and giving you a look at several menu items that we enjoyed throughout the weekend, as DFB staff have been busy sampling many of the goods and snapping pics of everything! From the atmosphere to the food, you’ll be well prepared when the time comes for your first visit to this new exotic hot spot! Spice Road Table is currently in its soft opening stage. 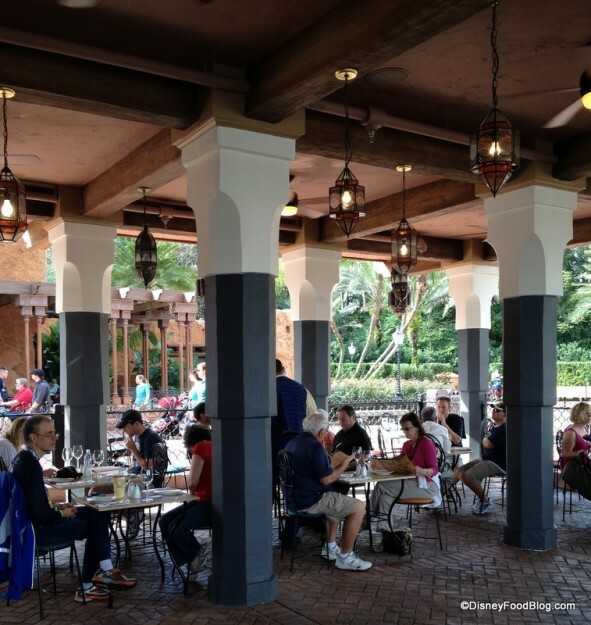 In Disney Speak, that means that it’s generally open for business, but could close without warning as they fine tune the menu and continue to train the staff. But from all indications this weekend, they are eager to forge their place along World Showcase Promenade! The restaurant was opened bright and early on Saturday morning, just as the rope dropped for World Showcase. 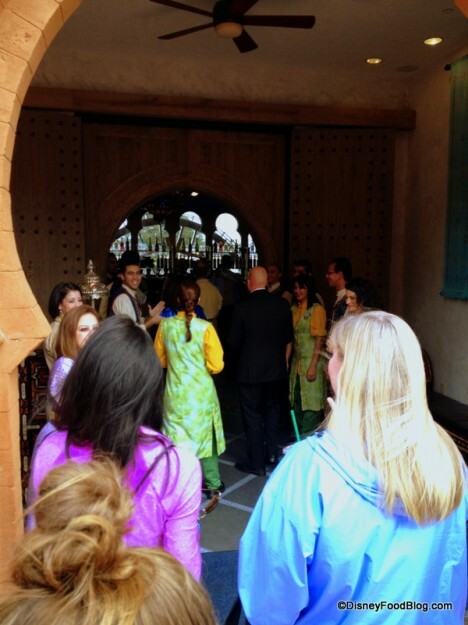 We were lucky enough to be the fifth guests through the door, and appreciated the cheers of the staff, who were excited to start the day. We’ve already shown you lots of atmosphere pics, but we have even more to share with you today to better acquaint you with the layout. Spice Road Table actually occupies one end of the renovated and expanded waterfront building, which also houses a gift shop (lots of food finds here — more to come about that! 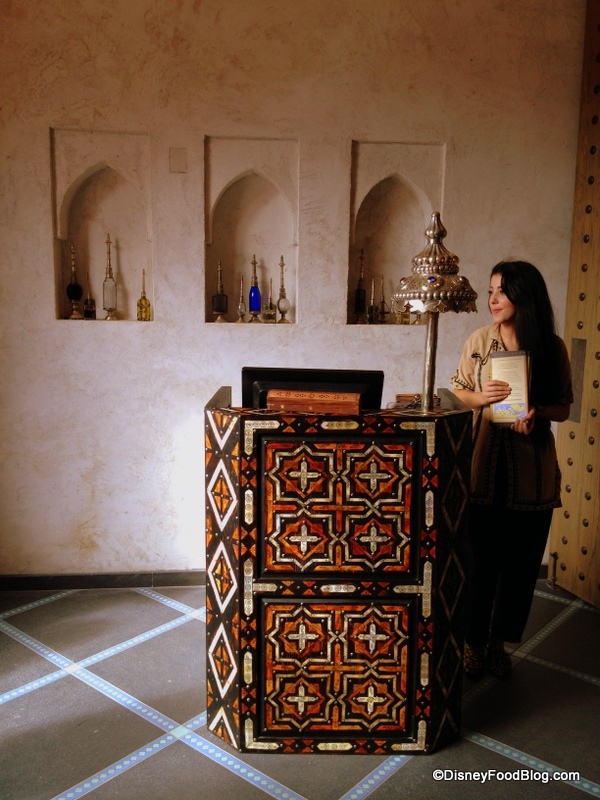 ), The Art of Henna tattoo stand, and the brand new Juice and Dessert Bar. Once you enter the restaurant, you’ll find the check in podium located to your left. The full-service bar is straight ahead. There is no bar seating at present, but it seems like you can walk up and order here. I’m hoping some bar chairs materialize here at some point. The bank of beautiful windows allows for plenty of natural light, and you’ll spy the rotating waterwheel outside through the windows — a nice detail. And I think this was recovered from the old area here, right? Walls within the bar are deep blue and provide a nice contrast with the light. The dark palette also brings a sense of cool to the spot. 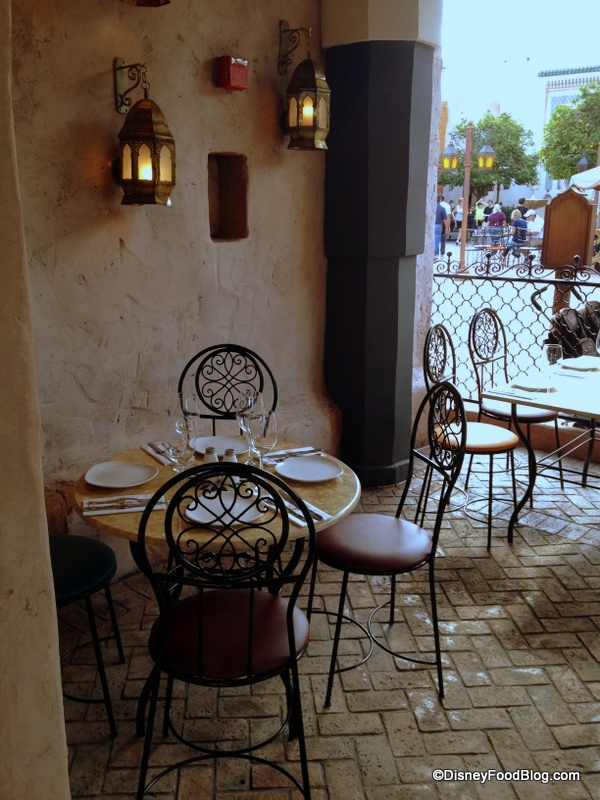 It reminds me a bit of the “cave” feel you get at Tutto Gusto. 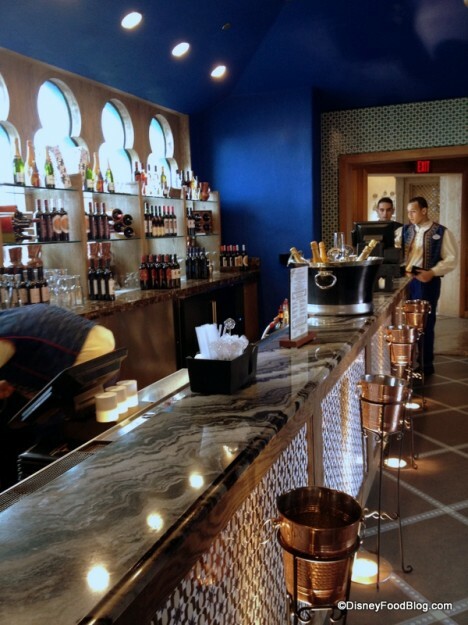 The bar itself is made of a beautiful, deeply contrasted marble. Plenty of ice buckets are on standby to keep your bottle of wine chilled tableside. 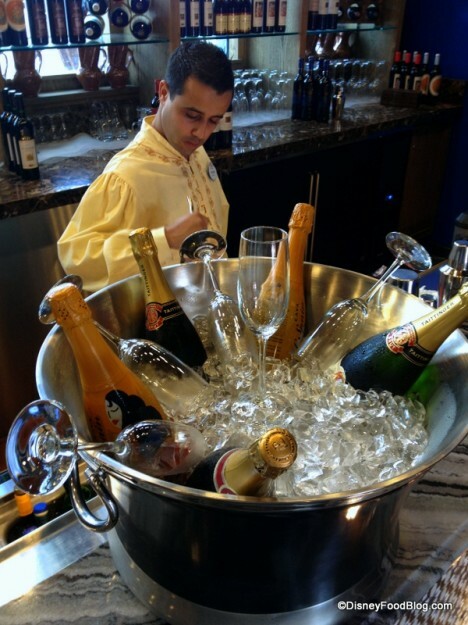 On Saturday, this huge bucket filled with ice served as a chilling spot for several bottles of Champagne and sparkling wines. It really gave the whole room a festive air. We expected corks to start popping at any moment! As you check in, depending on capacity, you’ll be given your choice of sitting indoors to the right or outside on the large covered terrace to your left. 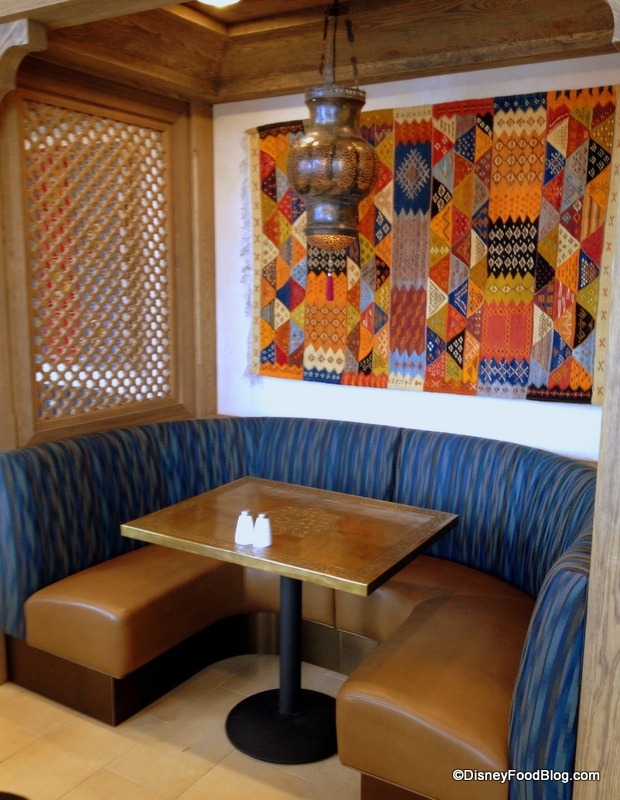 The indoor seating area is fairly small, but beautifully decorated. Well, it’s actually really small. Like, this is all there is to it. Floor to ceiling, arched windows allow for a great view of World Showcase Lagoon from all of the dining room’s tables. 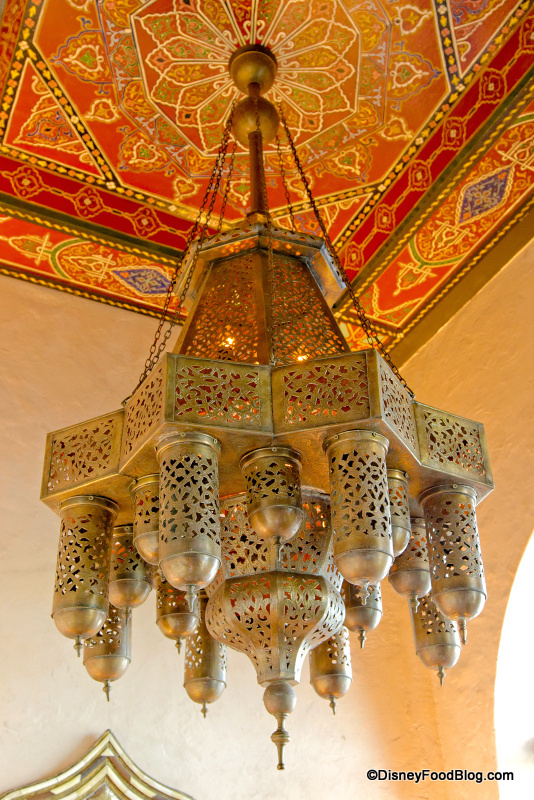 Ornate decorative objects are scattered throughout the room. 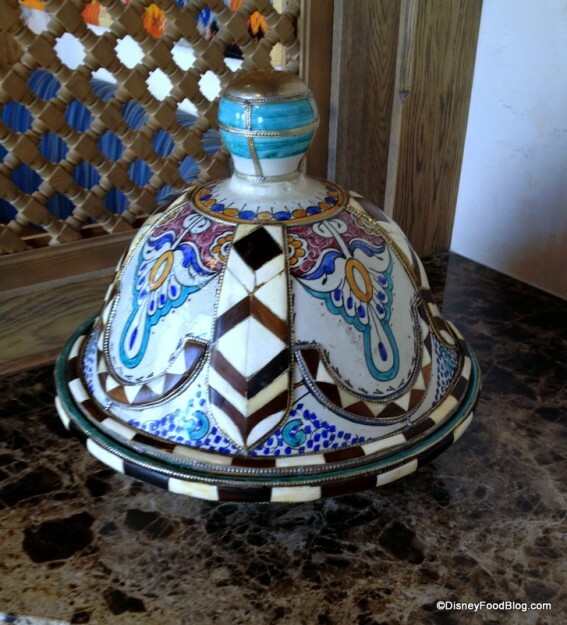 This beautiful tagine sits in a niche just as you enter. Wouldn’t you love to take it home? I would! You’ll notice the space above the far side of the room is decorated with shelving, which serves as the perfect display for a collection of Moroccan objets d’art (which I can totally say, ’cause they do speak some French in Morocco). Be sure to spend some time checking out the items. The collection, which includes tagines, small trunks and boxes, candlesticks, teapots, and more, is truly beautiful. And don’t miss the gorgeous lanterns everywhere! Seating throughout the small space is a mix of tables with chairs and booths. One end of the room and the wall opposite the windows feature these comfy, semi-circular booths — perfect for taking in the gorgeous view. 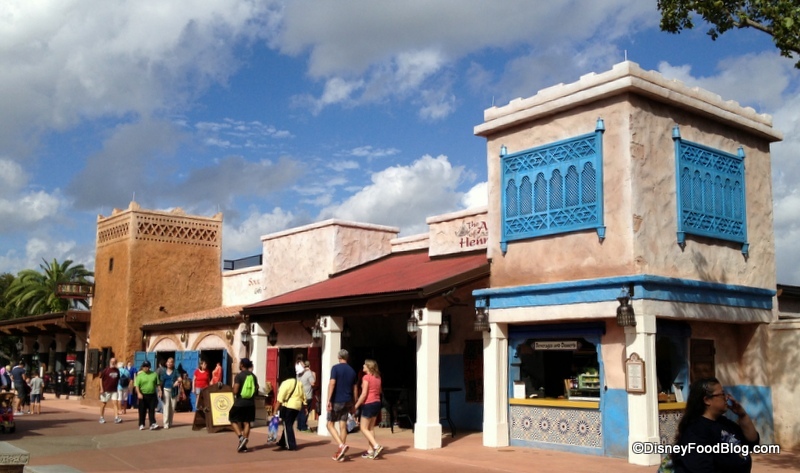 It has a very La Hacienda de San Angel feel to it. 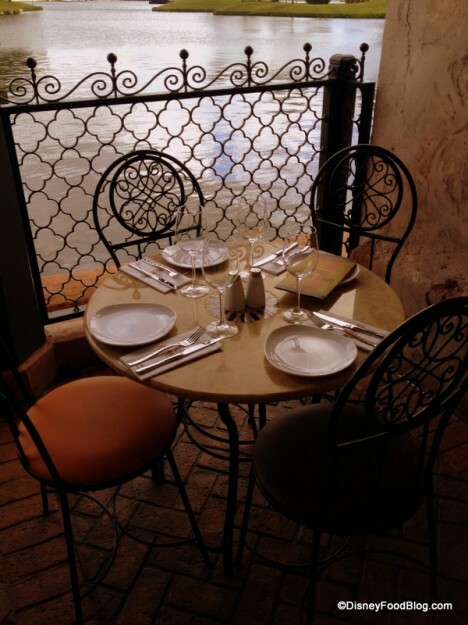 I would love to tuck into this nook for a romantic meal! You get your very own window and everything! 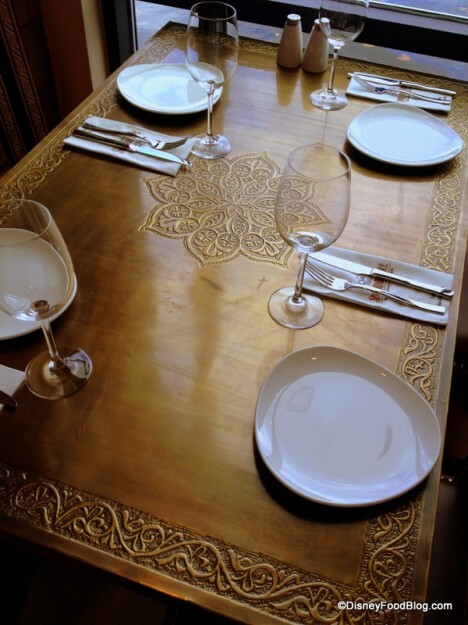 All of the tables inside feature this stunning decorative metal tabletop. Gorgeous! Chairs are heavy, large, and comfortably padded. 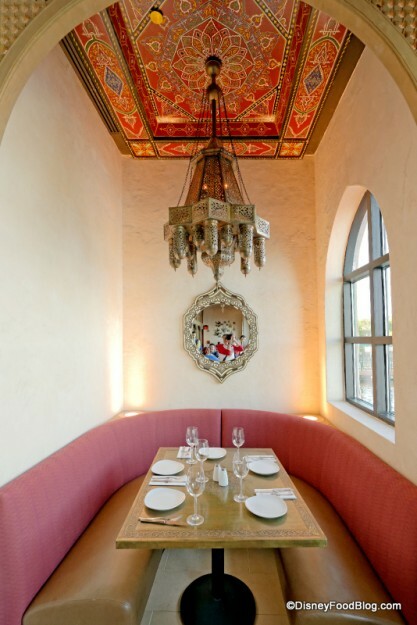 As we mentioned in our previous sneak peek, all tables, chairs, and accessories were actually crafted in Morocco, lending a further air of authenticity to the restaurant. 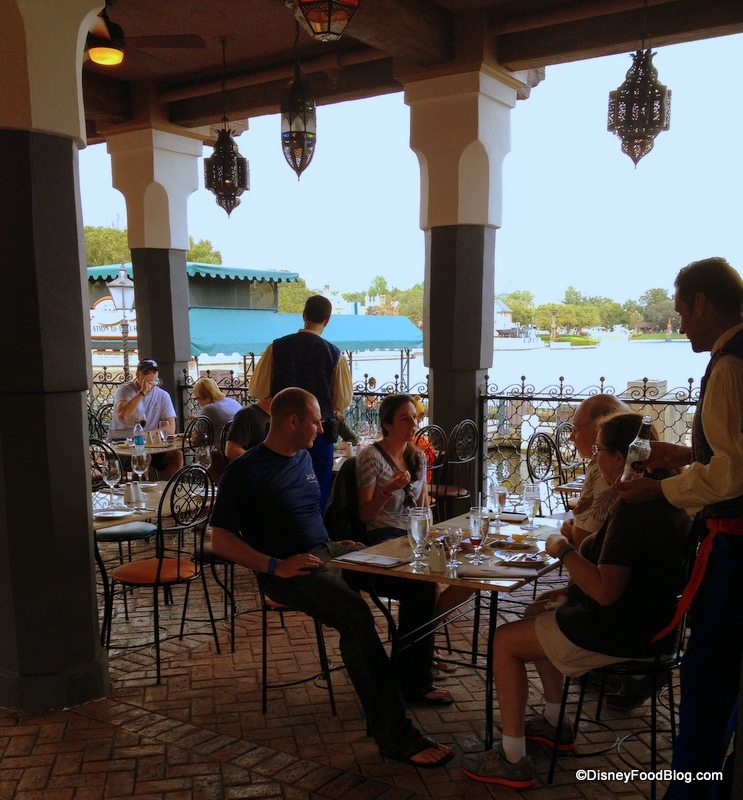 This visit to Spice Road Table happened to coincide with a postcard perfect Florida day, so we opted to sit on the terrace. The bricked terrace is completely covered, so no worries about a little rain. There are also ceiling fans to keep the area comfortable. Still, I imagine that if you’re visiting on one of those 95-and-so-humid-your-clothes-are-sticking-to-you days in July, you might opt for an indoor table! Especially because — depending on when you visit — you might be right in the midst of the sun’s glare. Starting at about 1:30pm, the tables closest to the walkway can be hit with a hard light from the angle of the sun, and that slowly keeps eating up the whole dining area until about 6:00pm. On his visit, our friend @Mealtrip said it was so bad that 3 out of every 4 people they tried seating in a sun dappled area (which is the whole area during the last hour before the sun goes down), refused and went someplace else. According to his waiter, 11:30-ish to 1:00pm it’s been pretty packed, and then at 7:00pm, folks show up, and don’t leave until after the fireworks. 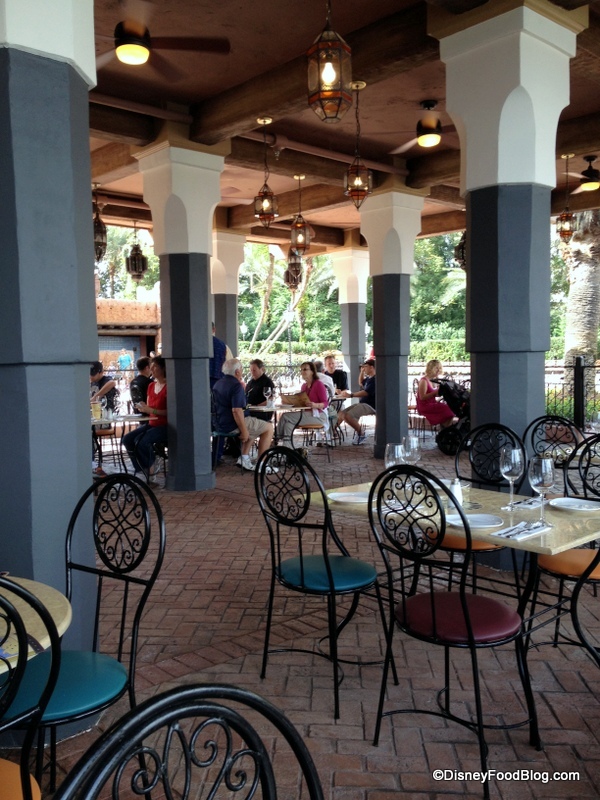 Table configuration may change or increase, but during our visit, there were tables near the railing that separated the space from the World Showcase Promenade, and tables located near the edge of the water. The area in the middle was left open. The tables are made of stone are are a mix of circular and rectangular shape. 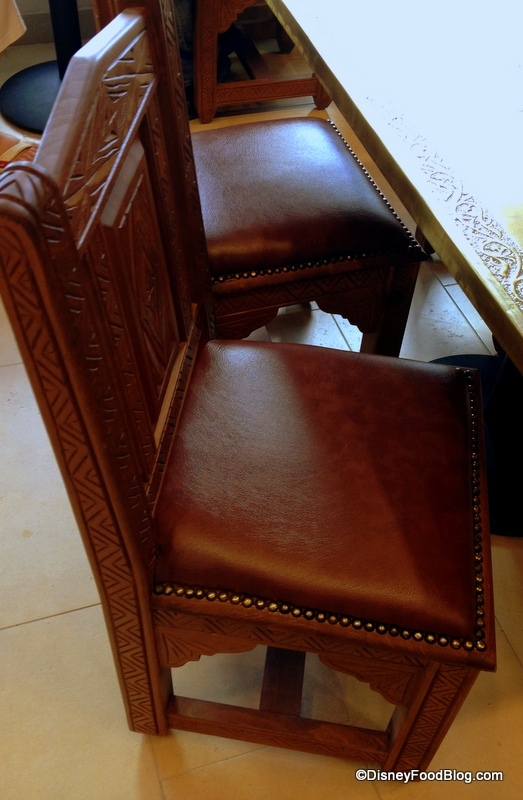 Chairs have wrought iron backs and cushioned seats, and were fairly comfortable. I just loved this table, tucked into a corner beneath a wall of lanterns. This is going to be a fantastic spot to sip wine and people watch as night falls on World Showcase! On the other side of the patio, tables overlook the water, of course. During the day, that provides for sweeping views of World Showcase Lagoon as Friendship Boats shuttle guests across the small lake. The terrace is the larger of the two seating areas, although I’m not sure it’s as large as it was first expected to be. Still, it’s clear the emphasis at Spice Road Table is on al fresco dining. We decided to enjoy a table right on the water! And with a view like this, can you blame us? Time to take a closer look at that menu and decide what to try first! 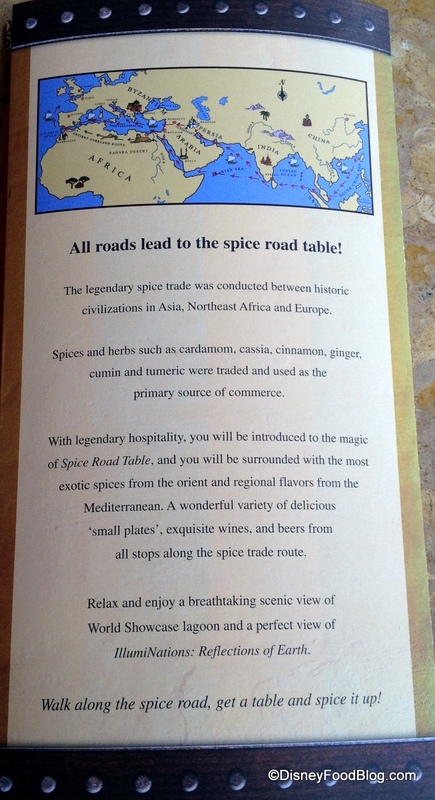 A glance at the back of the menu gives you a little bit of insight as to why Spice Road Table landed here in the Morocco Pavilion. 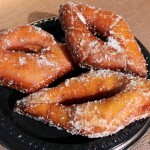 With food that celebrates the rich flavors of the countries along the route, there’s a great diversity to the offerings. 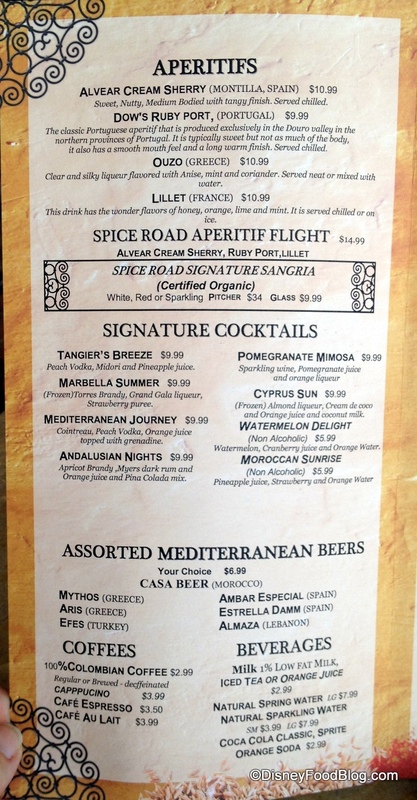 The Beverage Menu offers some really interesting choices. Choose from Aperitifs from different countries of origin. (I LOVE this!) You can also enjoy Organic Sangria in three varieties, or Signature Cocktails with hints of exotic flavors. 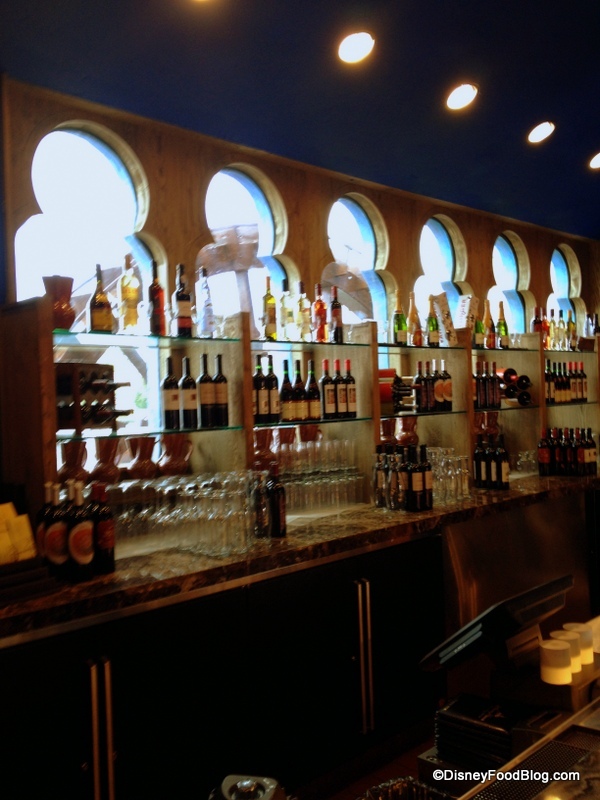 There is also a selection of Mediterranean beer as well as non-alcoholic beverage options. 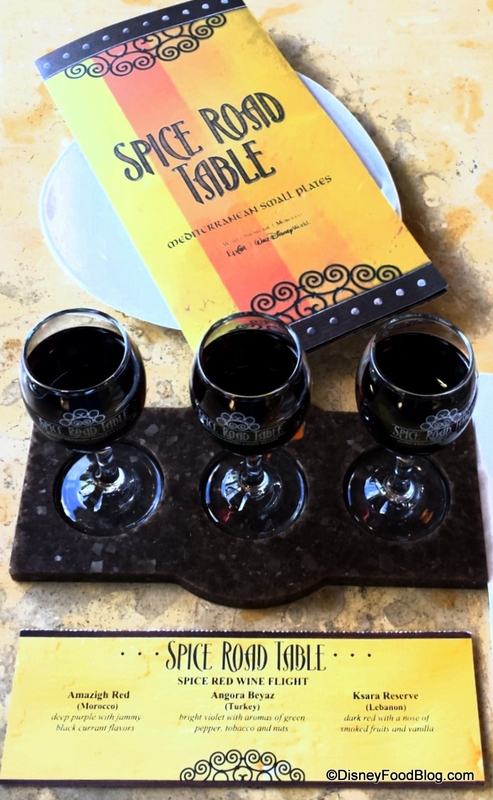 If you can’t decide on a single beverage, you may want to try the Aperitif Flight. 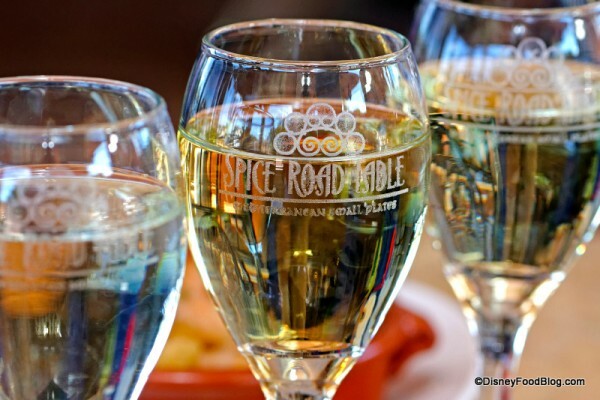 Another much anticipated feature of Spice Road Table was the promise that the restaurant would offer wines from the countries of the Mediterranean. And they’ve delivered! Check out all of these options! Of course, the star of the show is the food. The list of offerings is small, but it sounds pretty amazing — and includes a few vegetarian options as well. 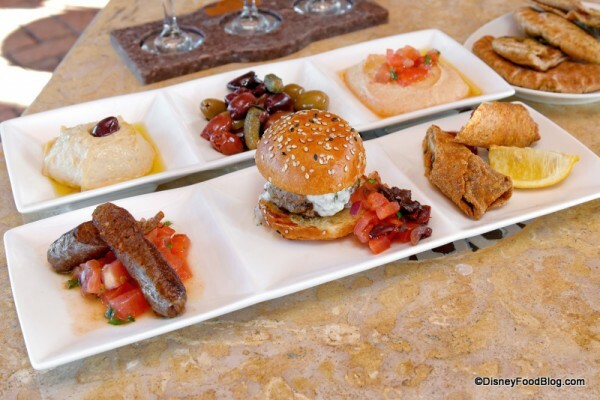 Two sampler platters allow guests to taste a greater variety of offerings. As far as entrees go, the Kids’ Menu doesn’t offer anything really in keeping with the restaurant’s theme (what is Moroccan style pasta? ), but they do have a couple of different juice/mocktail options that the younger set might enjoy. 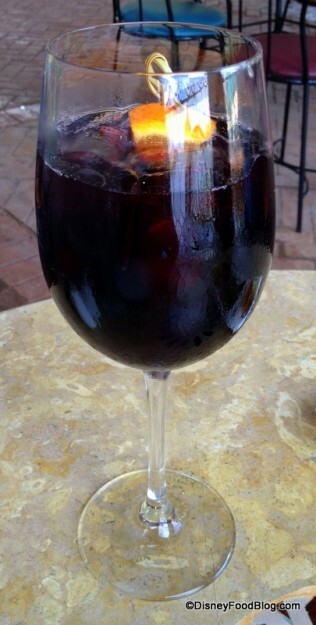 Our first choice was the Organic Sangria. It comes in three varieties — red, white, or sparkling. It was quite good, although not as sweet as expected (which is definitely not a bad thing necessarily). We were also impressed that the fruit wasn’t free-floating in the glass, but instead was frozen and skewered adding even more chill to the drink. We also opted for the Andalusian Nights based upon the recommendation of our server. 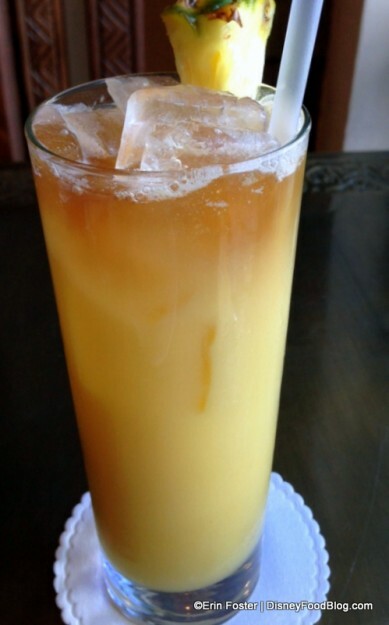 A mix of Apricot Brandy, Myer’s Rum, Orange Juice, and Pina Colada Mix, this sweet, exotic drink packed a delicious punch. We didn’t indulge in any of the flights (next time!) but managed to snag a few pics for you, (thanks to DFB reader Delana!). I always love the little information cards that come with flights. It’s such a fun way to learn and explore new flavors! Here’s the clever little Aperitif Flight, which includes Sherry, Port, and Lillet! 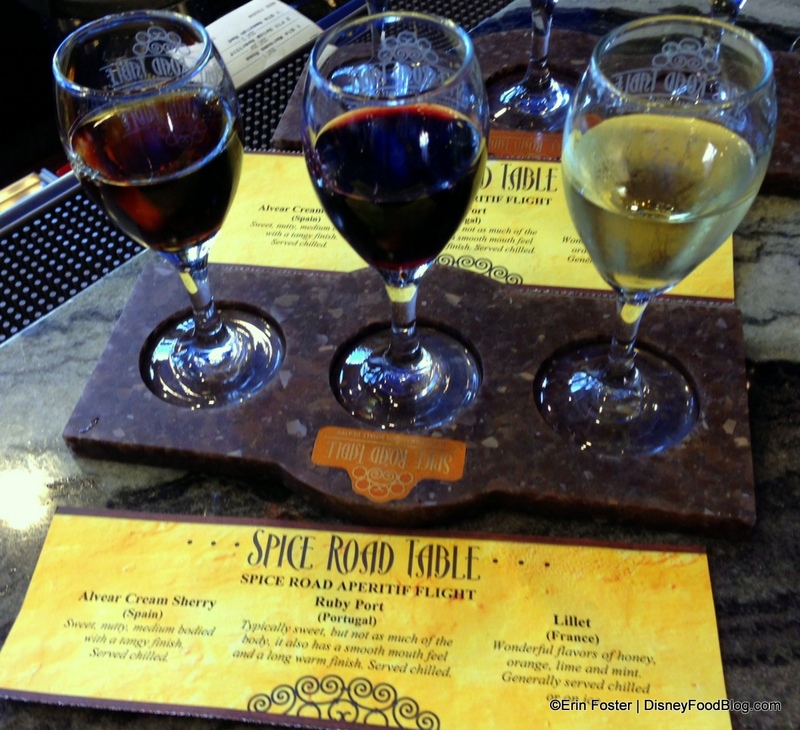 And here’s the “Spice” Red Wine flight, which includes wines from Morocco, Turkey, and Lebanon. 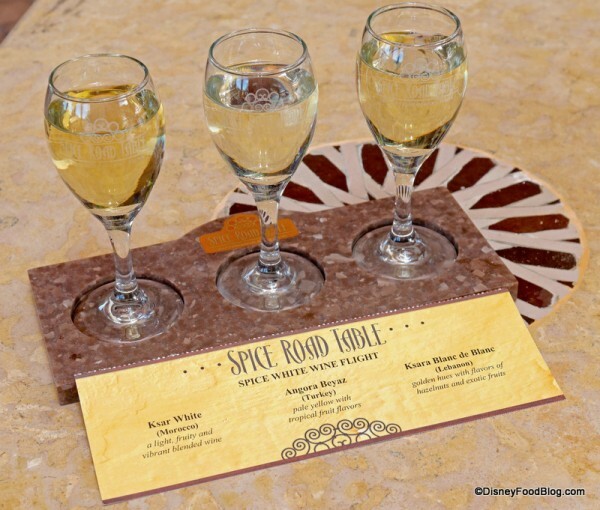 Our friend @Mealtrip also sent over a few of his awesome photos, and he sampled the White Wine Flight! I love the Logo on the glasses. We began with a couple of plates. First up, the Hummus and Imported Olives. 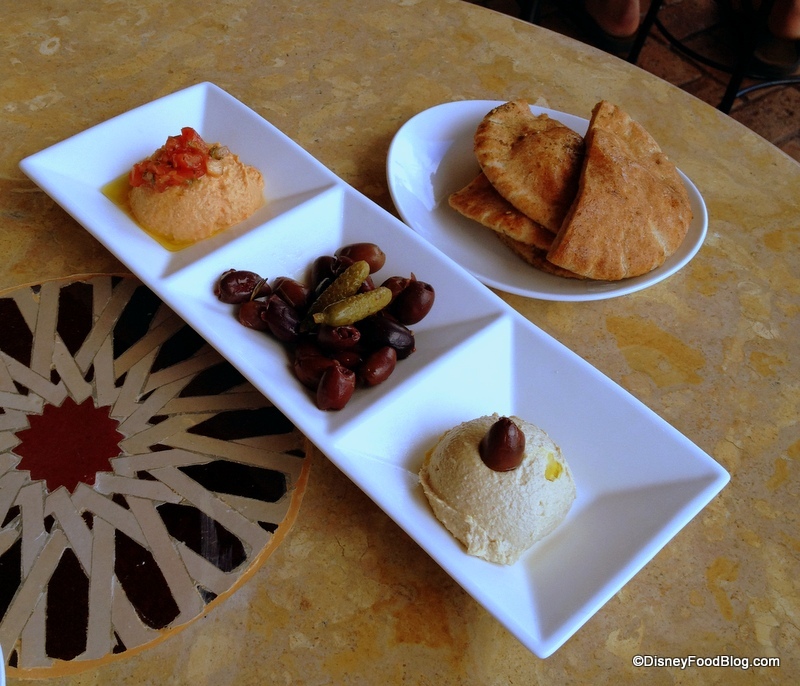 Two kinds of Hummus — Plain and Tomato — are served with Marinated Olives and Cornichons. Za’atar Flatbread accompanied the items. My server made a point to mention the olive oils that were used in each dish. 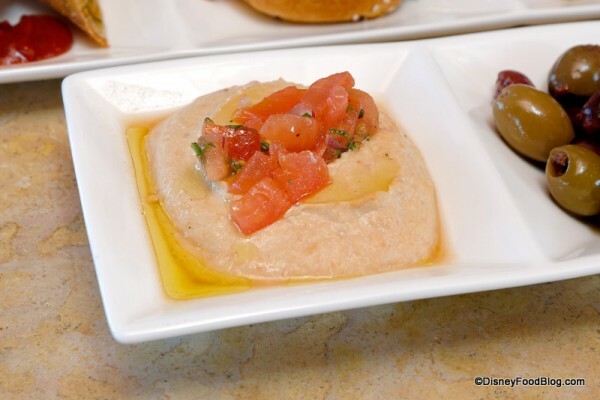 You can see that both varieties of hummus had a drizzle of olive oil on them. We found the flavor to be quite mild. 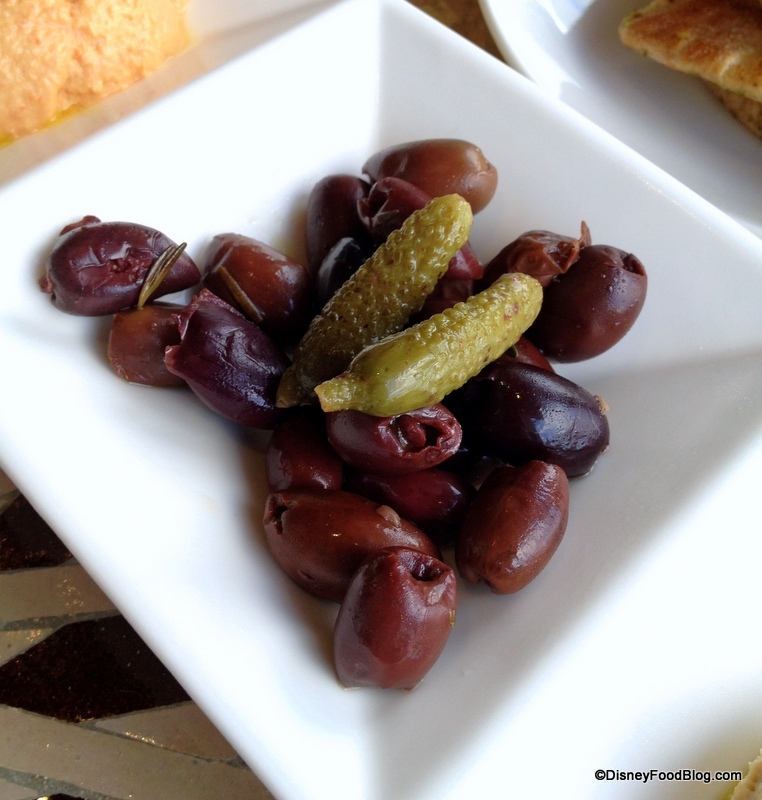 The Olives were marinated with herbs and garlic in olive oil and were delicious (according to the olive partakers). The Cornichons were mild in flavor without a trace of sweetness, a good accompaniment to the olives. The Tomato Hummus had a pronounced, fresh tomato taste. Overall, we preferred the plain hummus. It was comparable to hummus that we could get other places, but the flavors were balanced and the consistency very creamy. 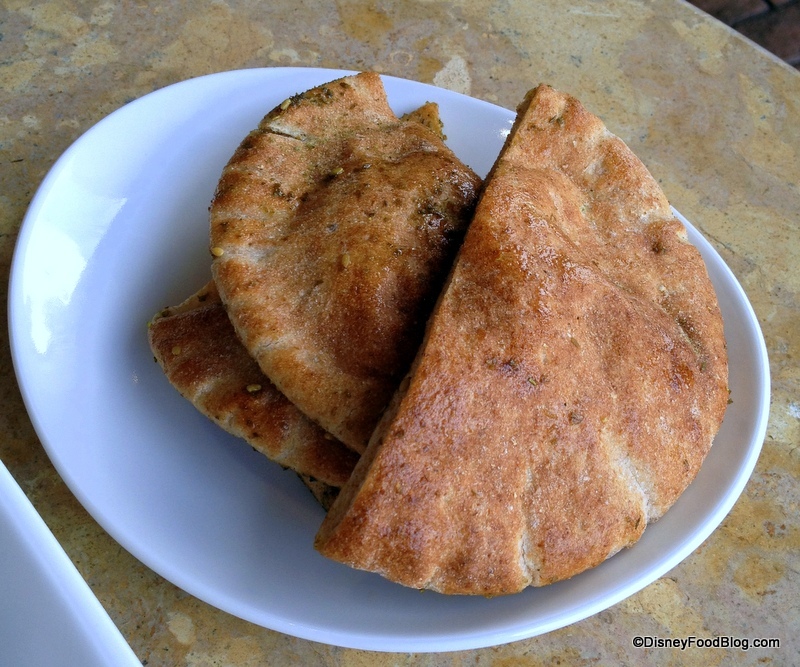 Za’atar Flatbread, in this instance, is Pita bread. Za’atar refers to the spice blend that is mixed with Olive Oil and drizzled on top. 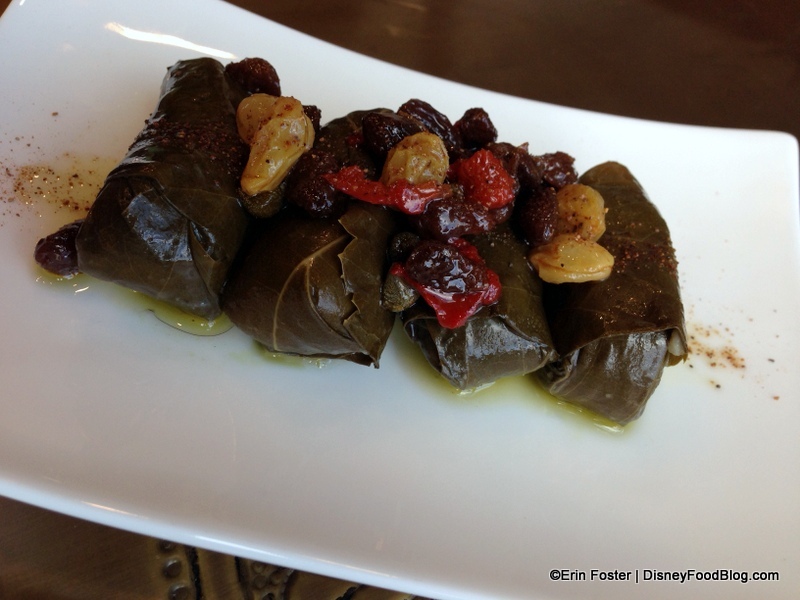 Anxious to try another vegetarian option, we also sampled the Grape Leaf Rolls and thought they were outstanding. The rolls are very light, unlike the ones you usually get with a supermarket Greek salad. 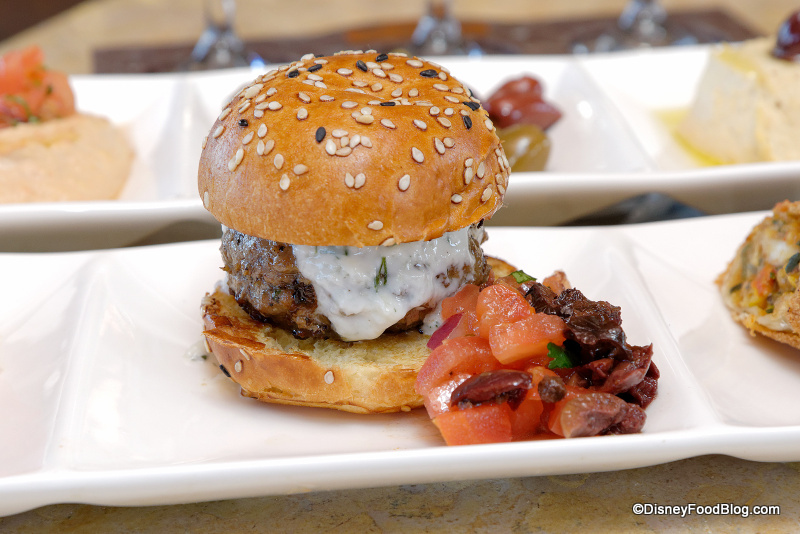 The Raisin and Caper Garnish gave it a fresh, clean sweetness. We’d actually like a whole dish of garnish on our next visit! @Mealtrip sampled the Spicy Shrimp, because it’s not one of the options in the sample trays… and it was actually his favorite dish! 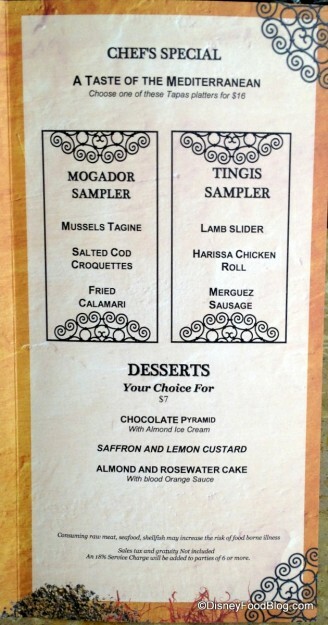 Next, we went for the Tingis Sampler, which features the Merguez Sausage, Lamb Slider, and Harissa Chicken Roll. We split opinions on the Merguez Sausage. 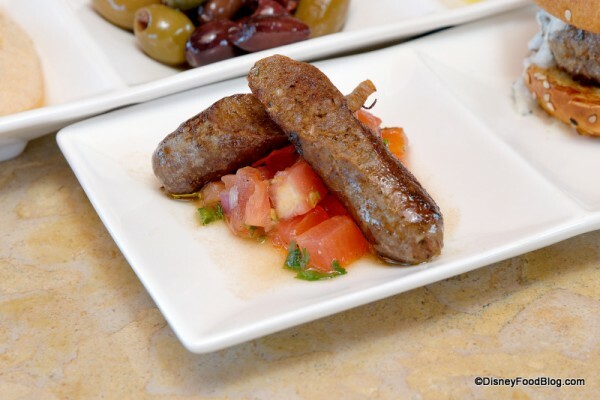 Some taste-testers really enjoyed the spicy lamb sausage, but others felt it was a little dry from the curing process, similar to Chorizo. 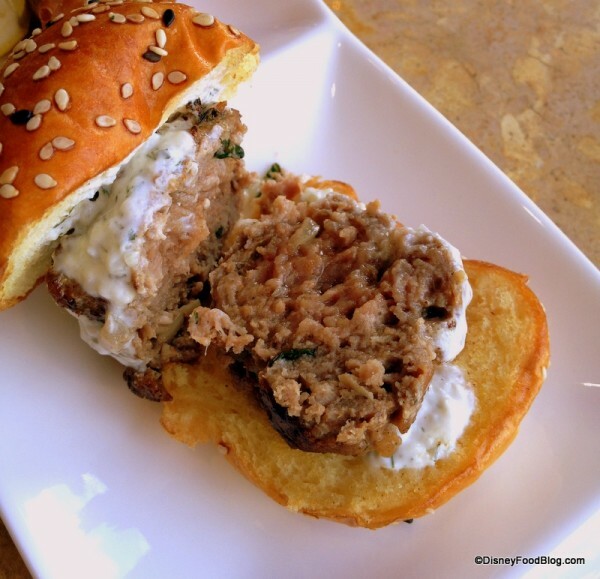 The Lamb Slider was a clear winner! Juicy, slightly underdone in the middle with delicious flavors from herbs and spices, the meat and grilled bread were a fantastic combo. The only complaint? 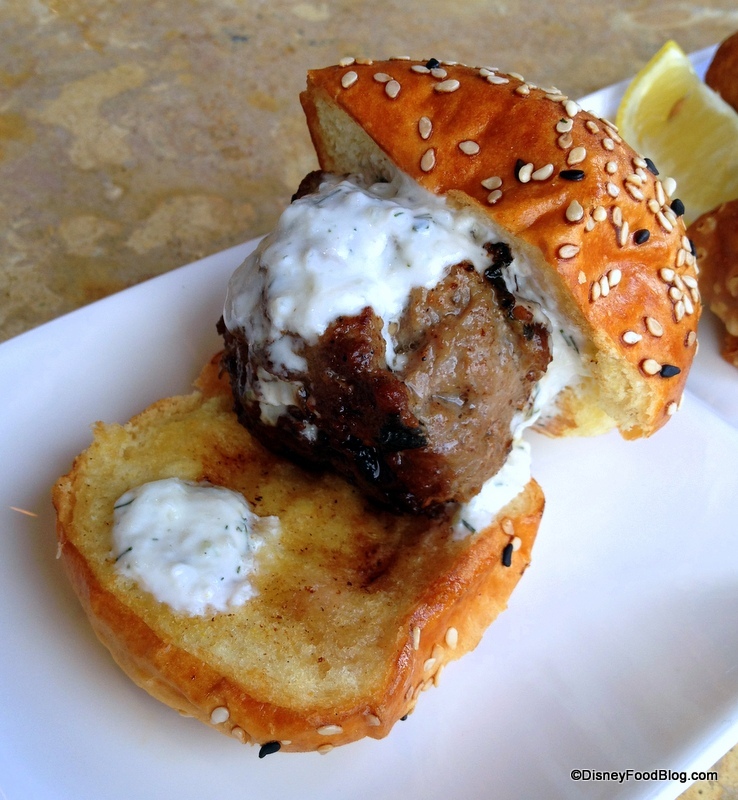 More Tzatziki, please! 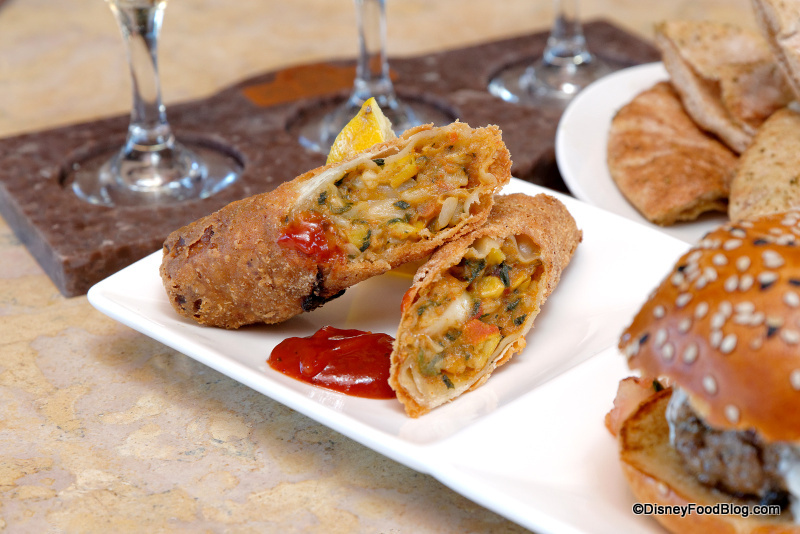 The Harissa Chicken Roll looks a bit like an eggroll. 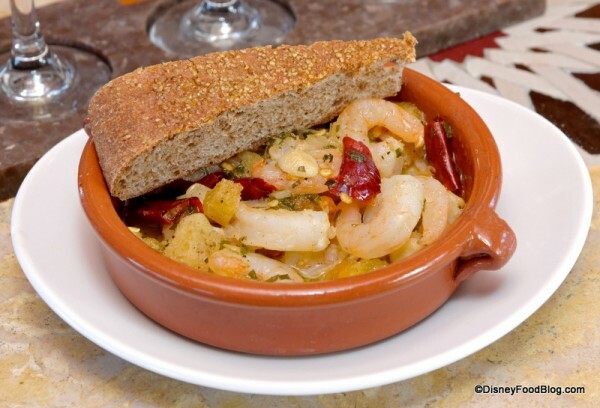 As a result it seems a bit like a fusion dish, and looks and tastes just like the one we’ve enjoyed from the Morocco Booth at the Epcot Food and Wine Festival in years past. It’s served with Harissa Ketchup, which is flavored with the North African hot chili sauce. We didn’t find that it was too spicy, however. The first sampler proved to be such a hit that we tried the other one as well! 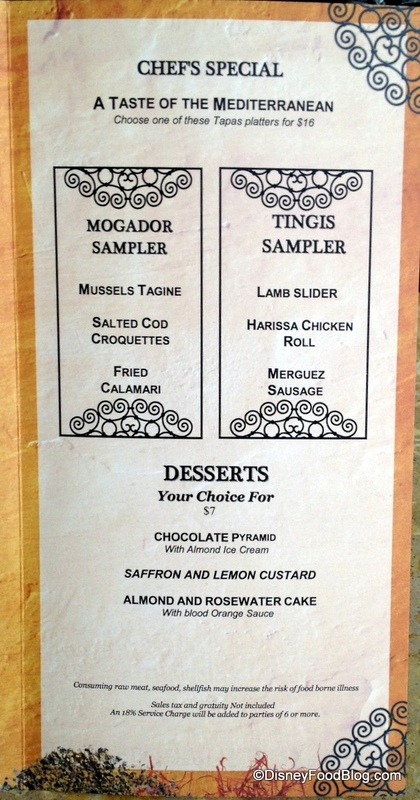 While the Tingis Sampler focuses on different meats, the Mogador Sampler offers three different types of seafood. The Calamari was first up. So, okay…this isn’t a terribly original dish. But when it’s executed well, it’s pretty great! And this was seasoned well and not overcooked, so it rated highly. 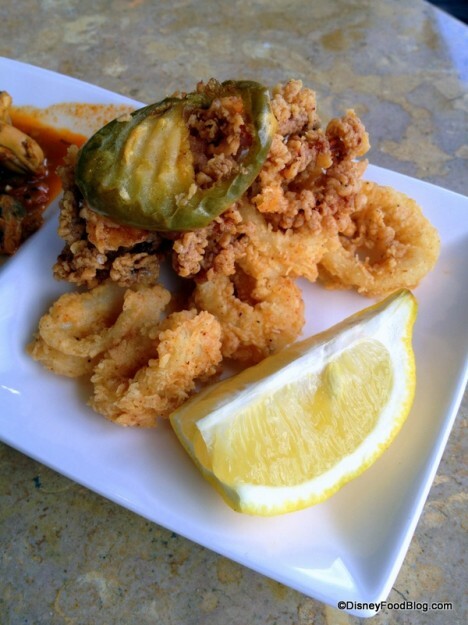 The Calamari was served with Harissa and Aioli. 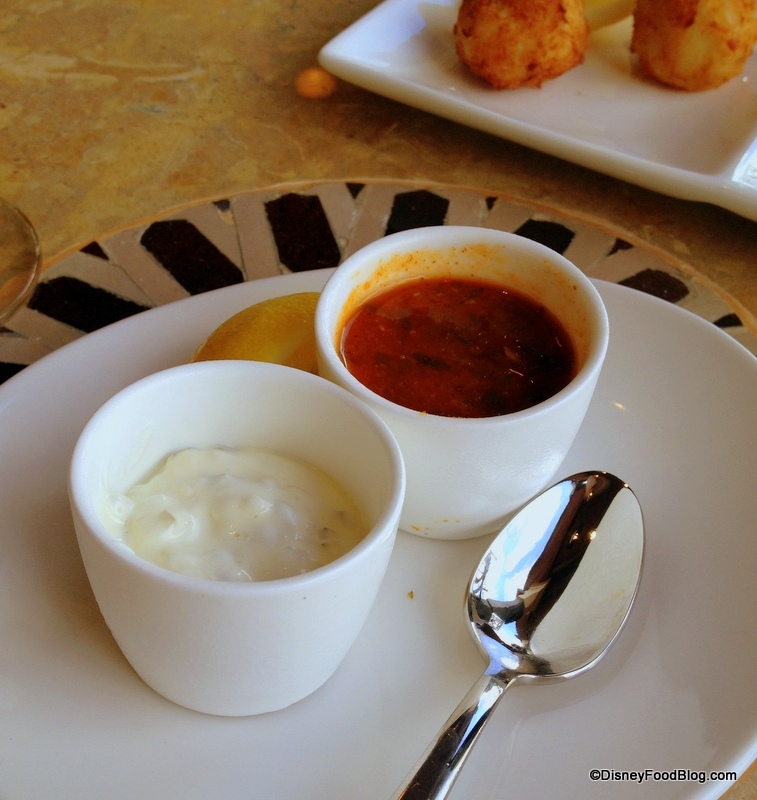 We actually enjoyed the Harissa Sauce with the Calamari and the Aioli with the Croquettes. 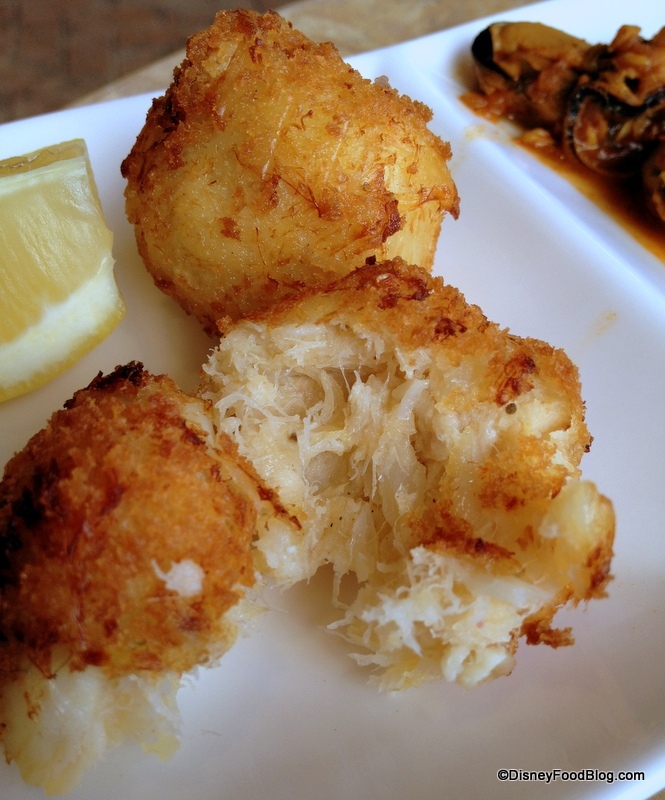 Speaking of the Salted Cod Croquettes, they were a surprising standout! Really light and flavorful, they were excellent with a drizzle of lemon juice and the Aioli. The only dish that we didn’t really care for was the Mussels. 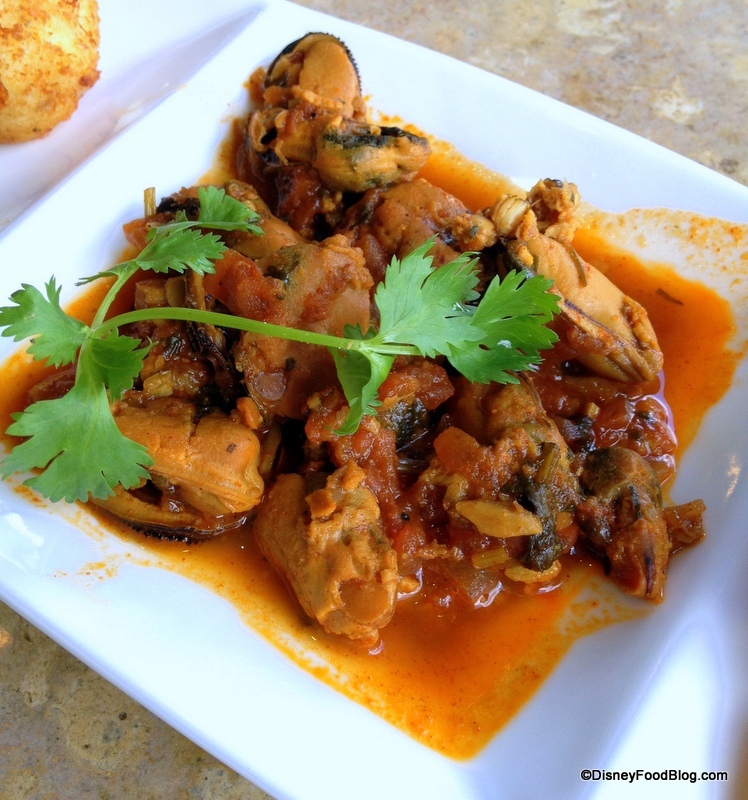 It could just be a taste preference, but tomato sauce, which seemed to have a bit of a curry flavor, overpowered the delicate flavor of the mussels, and the cooking method seemed to render them a bit mushy. They were fine. But not a favorite. Note that the non-sampler portions of these items are not quite twice the size, so you do get a good deal by ordering the samplers! We couldn’t resist ending our experience at the newly opened spot on a sweet note. Ah, sweet sacrifice! 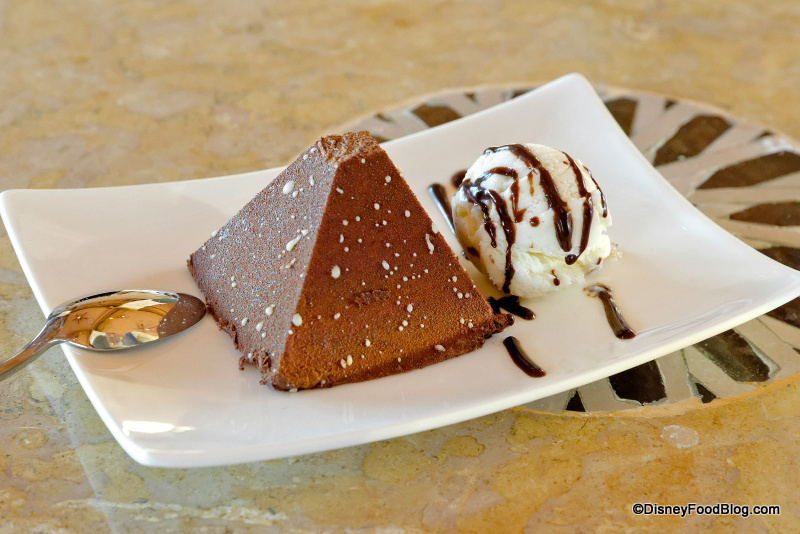 @Mealtrip tried the Chocolate Pyramid with Almond Ice Cream. He enjoyed it, and said that the Chocolate mousse-like pyramid did have an oozy white heavy cream in the center. A great mix with the almond ice cream. On our visit, we tried the Almond and Rosewater Cake. Served with Blood Orange Sauce, she enjoyed it. However, since the only difference between this version and the one served outside at the walk up Juice and Dessert Bar seems to be the sauce, we think you might want to save a buck or two and order it at the window. We also sampled the Saffron and Lemon Custard. I was super excited about this, since I love me some lemon! Topped with a beautiful sprinkle of chopped Pistachios, we thought this dessert was refreshing. Three distinct layers — a cakey crust bottom, a center of rich custard, and a burnt sugar topping — makes this sort of like a cross between a tart and crème brûlée. And there you have it! 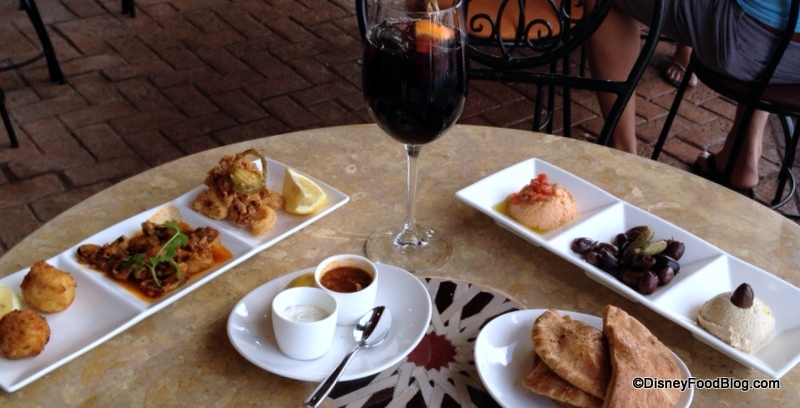 A fantastic spread, and an enjoyable way to relax on your trip around World Showcase! It’s unanimous — our first impressions of Spice Road Table are definitely very positive. 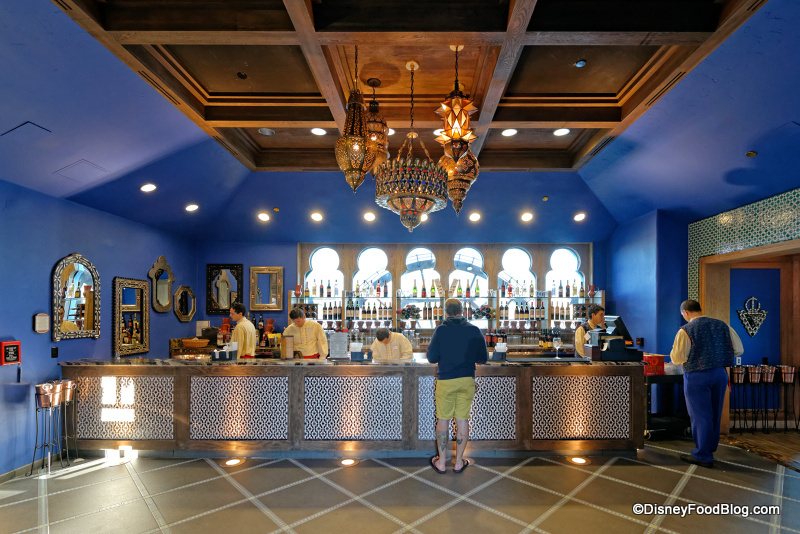 We’re so enchanted with the menu items, the setting, and the interesting, exotic drink options that we’d visit the spot even if it were located outside of Walt Disney World! There is the tendency, however, for this spot to become pricey quickly. Ordering small plates adds up. So if you’re famished when you stop here, keep that in mind. 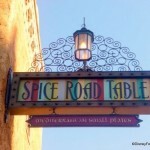 And given the fact that Spice Road Table does not participate in the Disney Dining Plan or Tables in Wonderland at present, it may not be a must-do for all guests. Also, do note that your food won’t all come out at the same time. Since this is a small plates/tapas restaurant, the food comes when it’s ready and the table simply shares (usually). 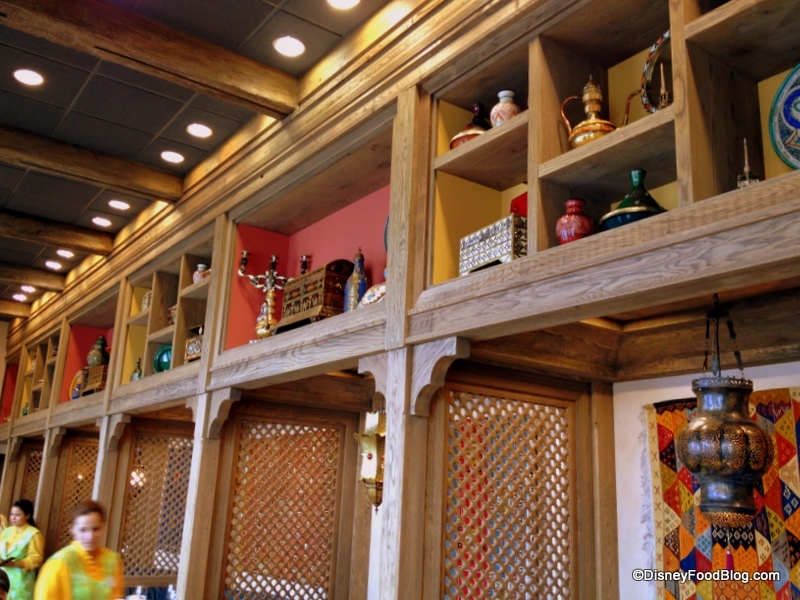 But if one of your favorite pastimes at Epcot is experiencing food and drink from all corners of the globe, we think you should stop into Spice Road Table for a look around. 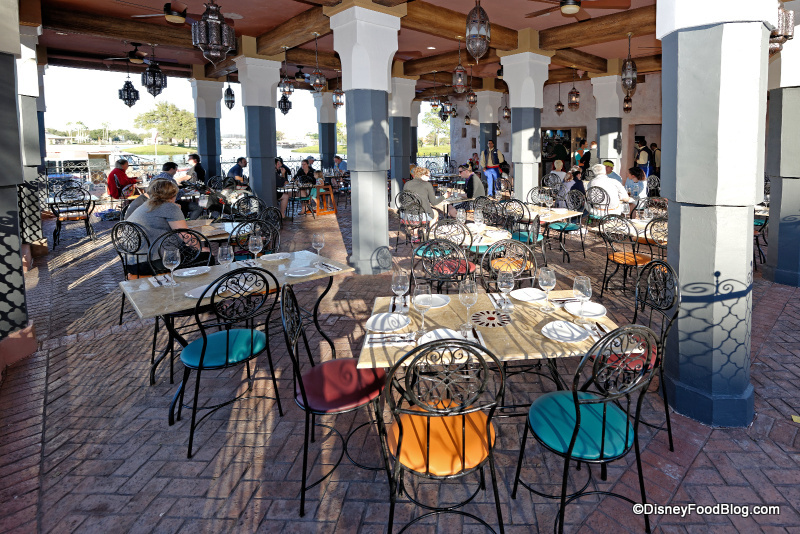 With the gracious service that the Morocco Pavilion is known for, the beautiful atmosphere, and that killer IllumiNations view, we have a feeling that this tapas spot is the next big Disney thing. 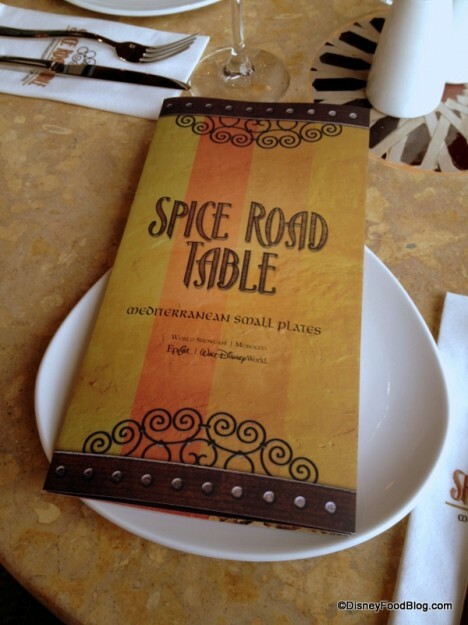 What are you looking forward to trying first at Spice Road Table? Leave a comment and join in the conversation below! Thank you the wonderful pictures and great review. I think it all looks and sounds wonderful. I’m just a bit surprised on how pricy they are for just tapas. I don’t know if I’ll be trying this place for a while. I am so excited to try this out in May. 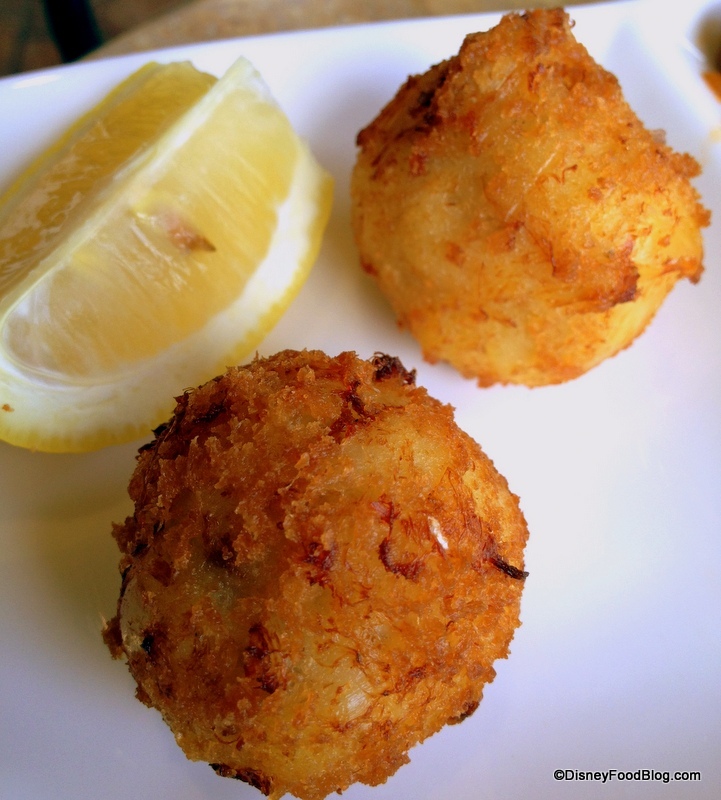 We have a couple of really good Tapas restaurants in our area and the prices here are very comparable.. I want to try everything. Lol! The lamb sliders and sangria are tops on our list! do you think that it will become part of the Dining Plan? Thank you for the timely and comprehensive review! I’ll be visiting WDW soon and wanted to know all I could in advance before making the decision to try Spice Road. All the dishes you described looked amazing and delicious. 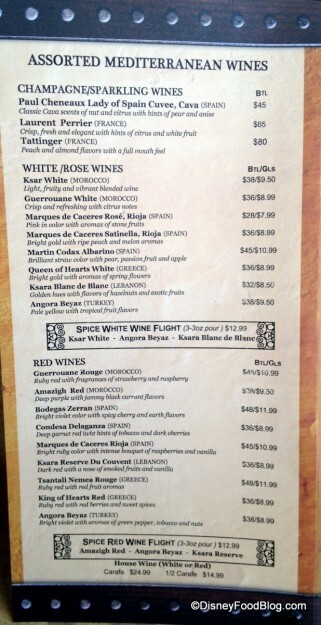 I’m not a wine drinker but I am intrigued enough to try a flight to sample those interesting flavors. I’m curious how you would measure the value. 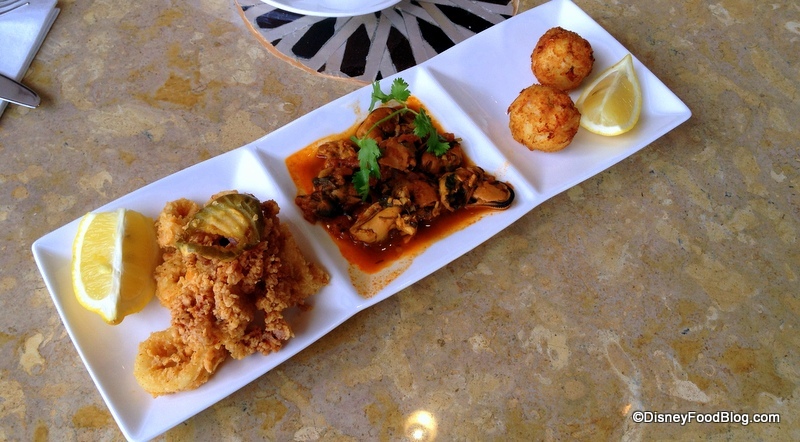 If you wanted to visit for lunch or dinner how many small plates would you need to make a satisfying meal? I just wonder how it compares price wise to some of the other restaurants. I agree your bill has the potential to skyrocket quite easily but if you were being conservative with your money how many plates would you think reasonable to split between several people to get a complete meal? I’m with Jenny. For a light bite or a snack while watching Illuminations I would not want to spend more than 4-$7.00 per tapa. I have been to really nice Tapa restaurants and that is usually the price. You could make a meal out of them but…. It would be pretty expensive to order a few items. I thought that was what it is all about ordering a few tapas and sharing. 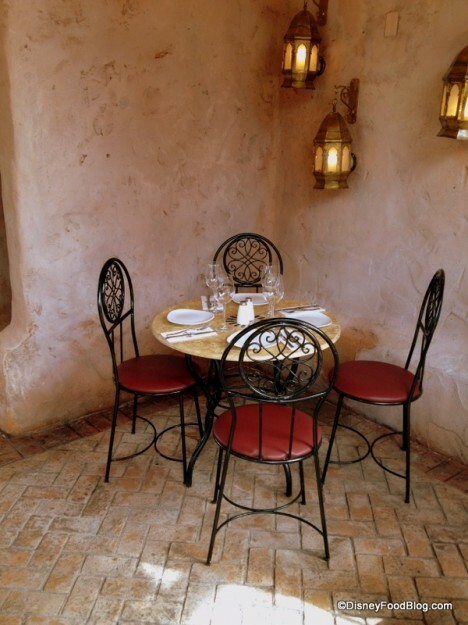 morocco already had a sit down restaurant. I hope they adjust their prices. Looks nice, and unlike some of the others commenting, I don’t think the prices are out of line for WDW – or for places around where we live (near DC). We don’t use the regular DP, just the QS, and normally do one special meal experience OOP each trip. My husband and I would love it, no question, but our selective eater son would be left basically with dessert (chocolate) unless they were willing to serve an adult with autism some chicken tenders. 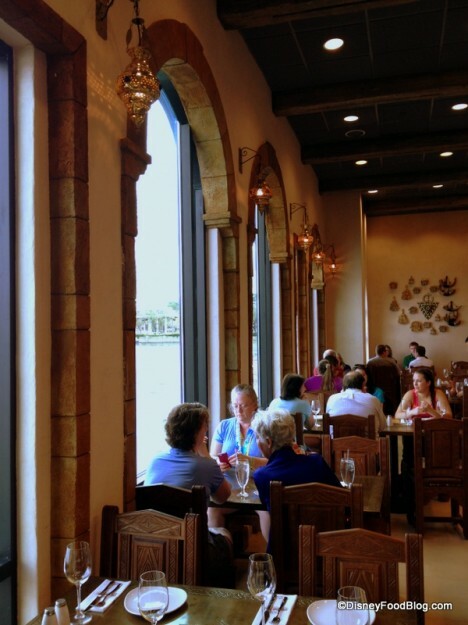 For the opportunity to relax in a beautiful atmosphere with a nice beverage, a savory plate, sampler and/or dessert, we think $25-30 per person is not too much (stuffed grape leaves, lemon custard dessert and a glass of wine would come in at this price). Of course, if they want to drop the prices, that would be good too! But the only hesitation we would have would be on our son’s behalf. 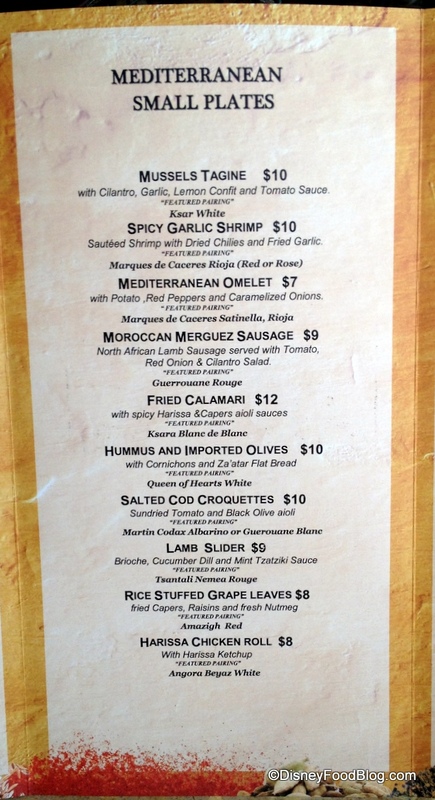 I’m near West Hartford, CT, and the prices are in keeping with most of our Tapas options around here, did not surprise me at all. Everything looks good! Thanks for the review. I might try it just my husband and I, but too expensive to take the whole family. Thanks so much for the review and all the pictures! The kids menu options seem strange. I’m at a loss for what moroccan spaghetti would be and I understand a burger for really picky eaters, but a grilled chicken kabob would have been a way more appropriate option than nuggets. Some kind of grilled or broiled fish would have fit the theme too. 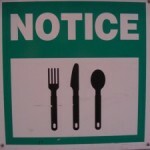 Also if this is table service, what are they going to do about turnover in the evenings? 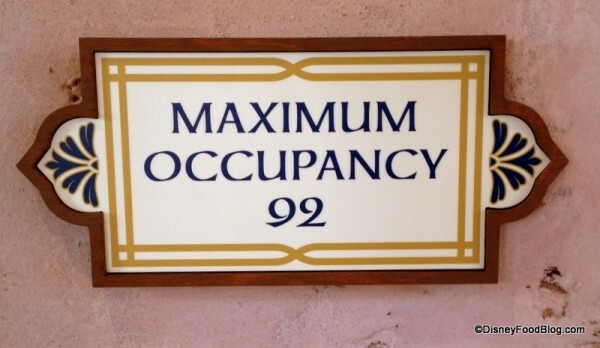 Because you know no one is leaving once they’ve staked out their Illuminations spot. 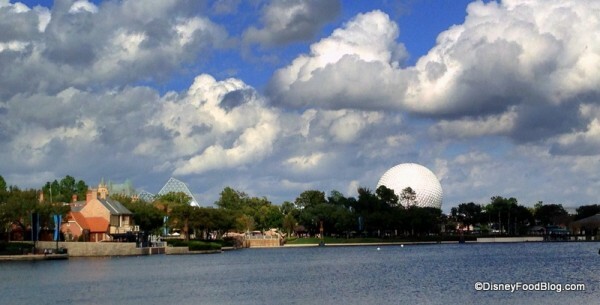 Come high time when the parks are busy, I’m sure people will be at those tables by 4pm that won’t want to leave. Is the restaurant just going to let them sit there without ordering additional items all evening or are people going to have to keep ordering? 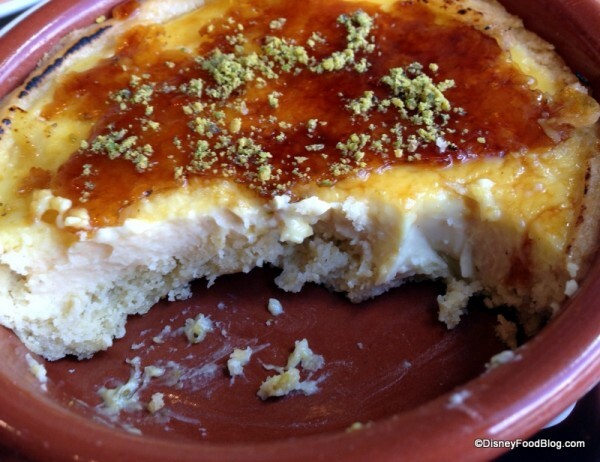 Is there no Greek/Turkish coffee? I’m not a drinker, so I’d love something exotic that was non-alcoholic. I noticed there’s espresso/capuccino…is it just your typical coffee or something more special? Great review! Looks so so good, but I am disappointed that it doesn’t seem to be accepting TIW. 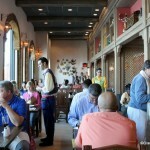 Tapas is so much fun with a group and we have eaten off-property at Cafe Tu Tu Tango when in Orlando on vacation. Prices are lower there, but I expected a Disney restaurant to be more expensive. Just was hoping for TIW. Thanks for the excellent review!!! Is the bar a walk up and order and then leave? Was already planning on giving this a try before your review, but now I’m definitely dining here with my family. After the soft opening is done, will it be possible to make ADRs on line for this. We’ll be there the last week of March. 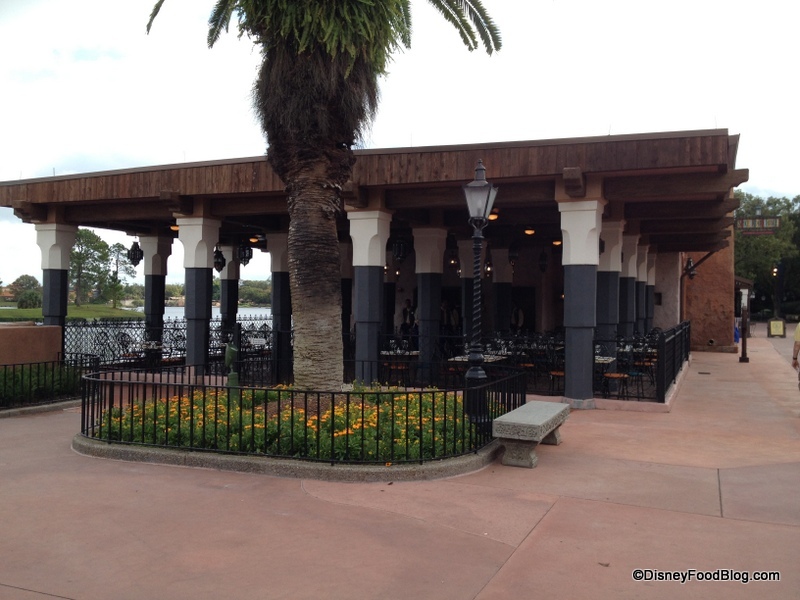 This will be so convenient from Beach Club Villas for a meal at Illuminations time! My wife and I had the opportunity to eat there this past Saturday and ended up eating half of the dishes on the menu and they were all fantastic. I would say that I think the pricing is a little steep and probably should be about $2.00 less per dish. We did recommend a “everything on the menu” combo, with the regular size portions of every dish (which would be perfect for 4-6 people) for like $80-85. Disney is going to make a bundle on this with the current price point, so I doubt they would consider lowering the price. *Do not let the sample fool you, it is not the same serving size as the regular order. We did not try any of the deserts, we instead headed over and had ice cream… which was amazing also! 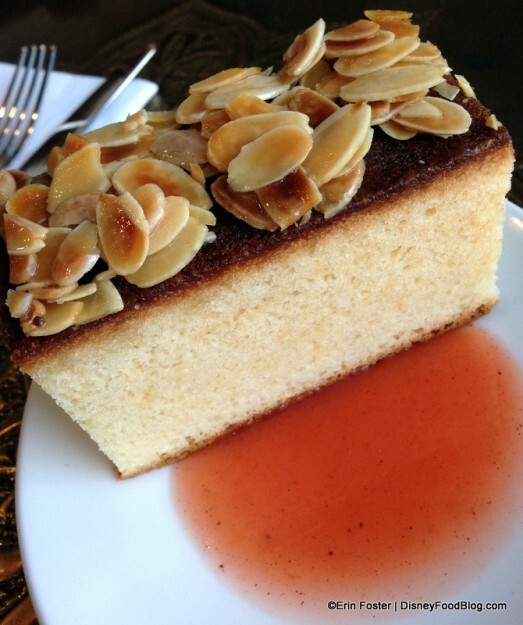 Our fave, the Almonds with Rose Water… Fantastic! Michael Earls — I doubt they will offer ADRs anytime soon. The plan for the restaurant was for it to not have reservations available. We’ll see! Looks fun ! I wish the wine list was a little more complete though, as I thought this concept was originally pitched as a small plates / wine bar similar to Tutto Gusto (which has an incredible selection at a comparatively reasonable premium). The markup on some of those wines is as aggressive as I’ve seen at Disney which, when combined with no Tables in Wonderland, suggests my visit there this summer will be significantly more brief than it might otherwise be. 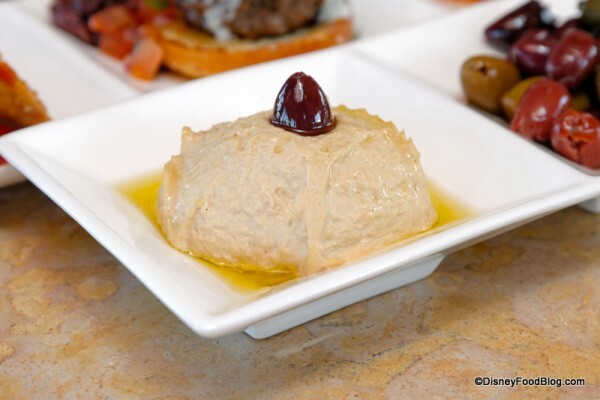 I have a member in my party that would love the hummus plate–and four (or is it three) halves of pita bread seems a bit stingy; especially if it’s 5 dollars to get another serving of bread. That would bring the cost of Hummus and Bread to 15 dollars. 1. Where is the review of the gift shop? Can you buy those engraved glasses? Cookbooks? Spices, even? 3. Does the locale of SRT mean the end of Mo’Rockin? We love enjoying their sound while lunching at Tangierine. 4. The Chicken Roll is probably more like the Beef Brewats on the menu over at Restaurant Marrakesh, rather than egg rolls. 5. Is there a non-alcoholic but adult beverage selection (other than Coca Cola products)? No Moroccan coffee or tea? Everything looks delicious except maybe the mussells which looks like something a lunch lady would slop at a school cafeteria. But hey…if it tastes good, who cares. 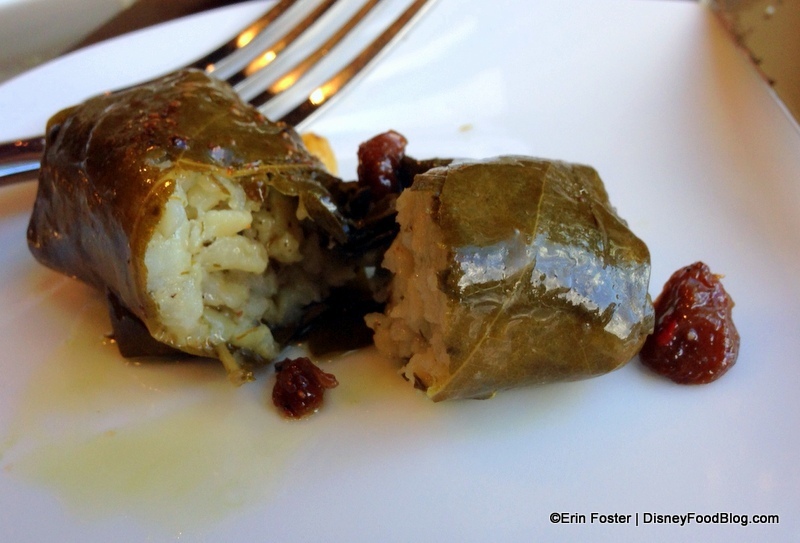 I think that the grape leaves are the most intriguing for me as they are different that the version that we see at greek restaurants here in Northern CA. I could definitely see the bill adding up if you weren’t careful though. Yay! Can’t wait to visit here, the vegetarian options look great (very nice to have some choice – I could totally see building a meal out of the grape leaves & hummus, and the omelette option looks meatless too…0. And that aperitif flight! 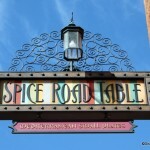 Thanks for the great review as always, I’m going to try to drop in at Spice Road Table this week if I can…. My wife and I just ate here on Wednesday. I think this review is fairly consistent with our opinions as well. We thought the atmosphere was amazing, but they do need to add some roll down shades b/c the sun was killer when we went (~2:30 pm). 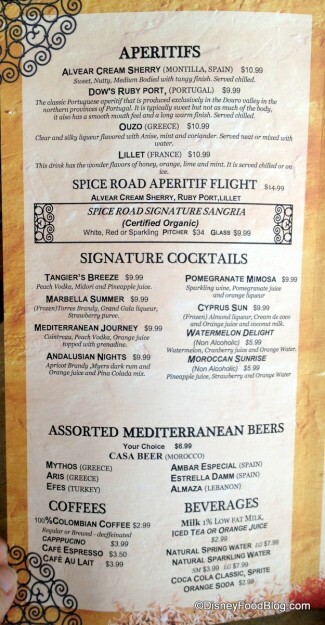 The wine/drink selection is a nice change from the rest of the places on property. I would recommend getting the wine sampler if this is your first time drinking some of these Mediterranean wines as the flavors can be quite different then the wines you’re accustomed to drinking. 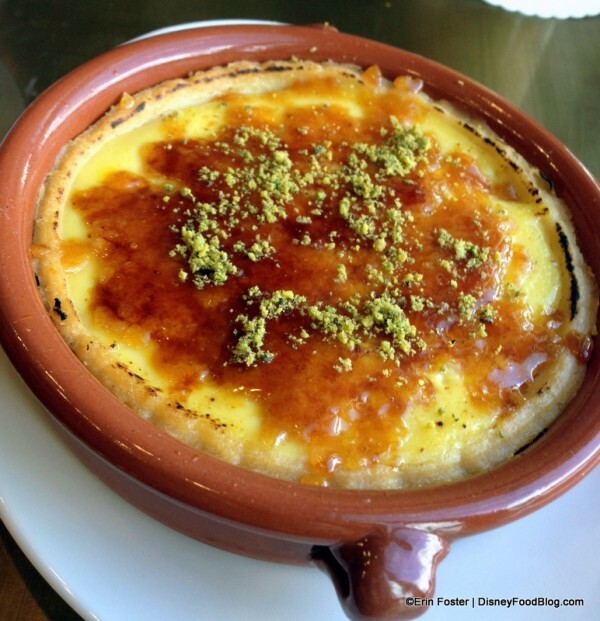 I also would like to see them add some Turkish coffee (I love it! ), as Jenna commented above. As for the food, the flavors were all unique and i like that many of the dishes have a little heat to them – Disney is known for steering clear of spicier foods, so i’m glad they stayed true on these. I go a lot of tapas restaurants and while prices are fairly similar to these, the portions here are little smaller than I’ve seen. So don’t go here expecting to have a filling meal and pay less than $40-$50 per person (my wife and spent $75 and left hungrier then when we got there). I think this place maybe very polarizing as some guests will be worried about the unfamiliar ingredients or style of dinning (tapas). In the end, i think with maybe a little tweaking they have a winner here. And I hope they keep with ADR free and DO NOT add this to the dinning plan b/c it will most assuredly increase the costs or decease the quality/value or more likely, both!. Mike Venere – the bar is simialr to the one in the wine bar in Italy. You can just walk up order and leave, or you can stand and hang out at the bar. They have menus on the bar so I assume you can order food as well – but you have to stand. 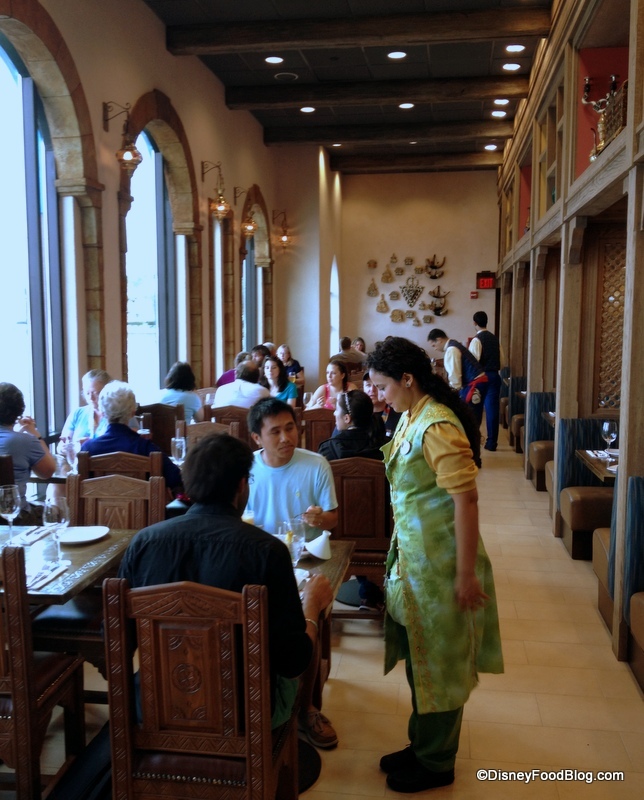 Having Morocco in my top three for both table and counter service as well as pavilions in general, I was excited to try SRT this past week with some out-of-town guests. We were able to experience both seating areas as it stared to rain very heavily, very quickly while eating outside. The staff was excellent, and quickly helped us move inside. 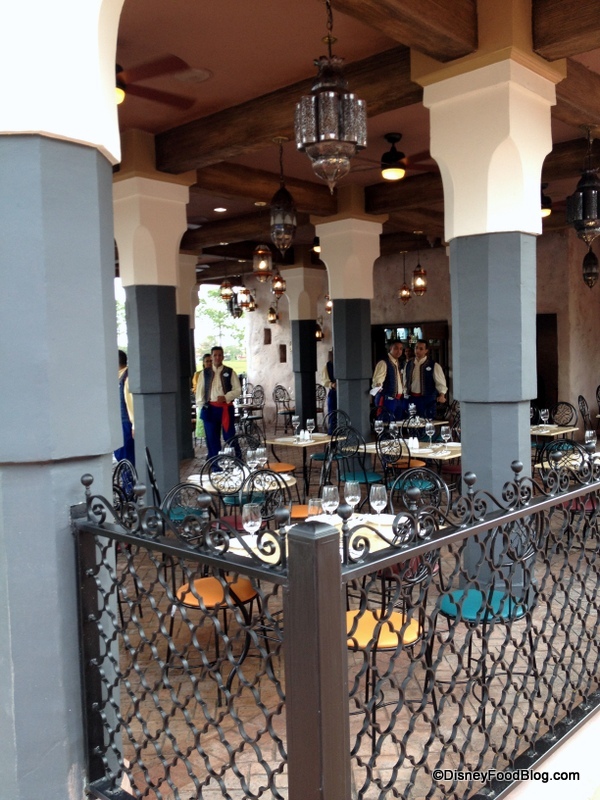 As much as I loved the alfresco area, the inside was a surprising delight. Even through the driving rain, our view was enjoyable. The staff made it quite clear that we were to take our time as it would be raining for quite a bit. Unfortunately, I wish I could rave about the menu as well. The hummus was just okay, but at least a decent portion, though very stingy with the pita. The merguez sausage was tasty and a bit on the dry side, but I expected as much so it didn’t bother me. I felt the biggest failure was the portion size vs price. I know it’s disney, but the portions were way to small for the prices being charged. There are too many better options around; why empty your wallet here and leave starving. Has anyone eaten here during Illuminations? We have an 8:10pm reservation on a night when the show is at 9:00pm. Can you see it from inside? Do they still have the Sample Tapas Platters? I don’t see them on the Disney menu. Thanks!